In case you noticed the girls wearing some of the same clothes they wore to Lagoon ( I am sure you did) there is a good explanation. When we arrived to Utah we realized that the girl's bag didn't get transported. The conversation between Jeff and I was something like this. Me: "I thought you grabbed all the stuff that I had in the hallway." "I did!" "I know I left the girls bag in the hallway with the rest of the stuff." "There was nothing left in the hall!" I had packed everything, their clothes, accessories, shoes all into one duffle bag. I was so proud that we could get everything into one bag. I left it out in the hallway and later come to find out, Gabrielle took the bag back into her room and opened it to put more stuff in. We found a second hand store nearby to get some clothes, swimsuits, shoes, etc. The girls didn't mind it, but I did. Thanks to Aunt Doris, we were able to go to the zoo. This zoo was way better than our local. I love the Giraffes! I have this memory of seeing tall, tall giraffes when I went to the Phoenix Zoo, long time ago. I was so impressed with how tall and long their necks were. As an adult, I was very disappointed the Boise Zoo got their giraffes. They were a lot shorter and smaller than what I had remembered them to be. You know how when you go back to a place you went to as a kid, you realize everything doesn't look as big as you thought it did. I figured that this was the case here. Well, I was pleasantly surprised when I saw these giraffes! So tall, just like I remembered them to be. They have long tongues, kind of creepy, but so fun to just watch them move, eat and interact. This baby was so cute! Grizzlies! I am very afraid of bears. Lego Polar Bear...can you imagine putting this together? 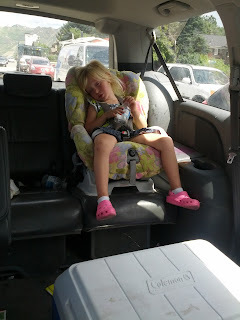 After spending the whole day at Lagoon and part of the day at the zoo, we were tired! Gabrielle was very very tired = grumpy! :) We continued on to Ikea and then to my brother, Bob's house to celebrate his birthday!